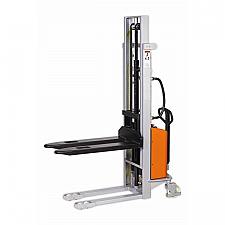 More versatile than a hand pallet truck but not as heavy duty as a forklift truck, pallet stackers can be an economical avenue to increasing storage capacity without the capital outlay normally associated with their larger brethren. 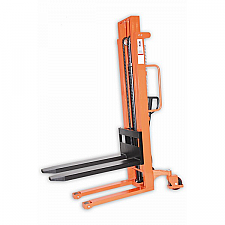 Pallet stackers can also be described as stacker trucks, stacking trucks, manual stackers, semi electric stackers, straddle stackers and powered counterbalanced reach stackers. They all have the same purpose - to lift a load to a given lift height with a view to placing it either in block stacking, pallet stacking or placement on a mezzanine floor. 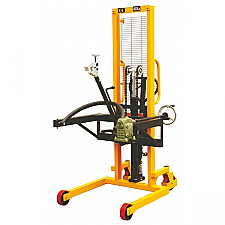 Handling Equipment online offer a generous selection of stackers, from 400Kg Ministackers through to2000Kg pedestrian controlled powered reach trucks with speedy delivery from stock. Please browse the range in this section or call us directly on 01384 895859.